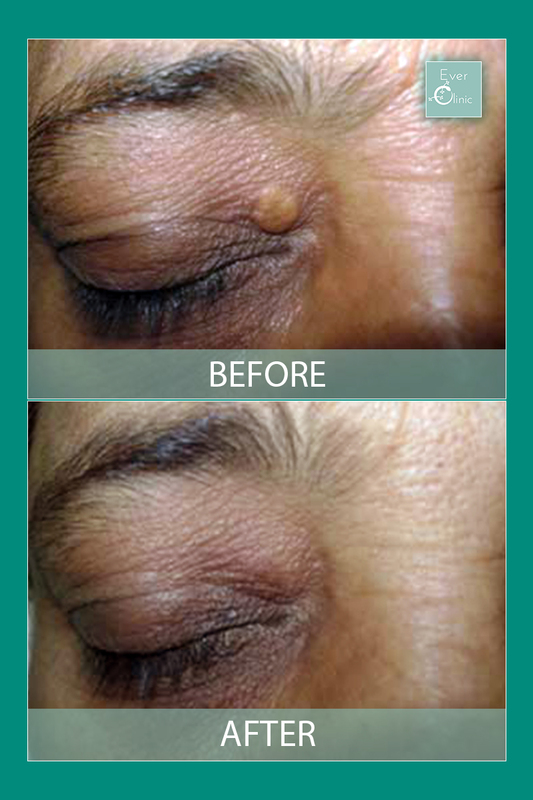 Xanthelasma Palpebrarum (XP) is a type of skin lesion that commonly presents in middle-age. A benign cosmetic lesion, more correctly known as a xanthoma, they are largely composed of cholestrol. As such, having these lesions can point to an underlying dyslipidaemia, most commonly a high cholestrol level. XP has been reported following inflammatory skin disorders, and allergic contact dermatitis in spite of normal lipid levels. Lesions present clinically as sharply demarcated yellowish skin plaques on the eyelids, usually close to the nose. Various treatments have been used for patients with XP, including surgical excision, eletrocautery, and trichloroacetic acid (TCA) application. Care must be taken to avoid scarring, everted eyelid (ectropion) and pigmentary changes, especially with more aggressive treatment and higher concentrations of TCA. A more high-tech approach would involve the use of laser. In fact different types of laser have been tried, including carbon dioxide laser, argon laser, KTP laser, erbium: YAG laser, and pulsed dye laser. One recent study directly compared using 30% TCA with ultrapulse CO2 (UpCO2) laser. While both performed well over the (up-to) 3-month treatment course, the more severe lesions fared significantly better following UpCO2 treatment. In theory, the use of a Q-switched Nd:YAG laser for XP would selectively target the fatty tissue and avoid the potential major side-effects such as skin thinning (atrophy), scars, blisters or pigmentary change. Sadly, the clinical benefits have not been demonstrated adequately by clinical trials. It’s worth adding the new kid on the block, the plasma device. This readily available hand-held device utilises electrical energy to produce a plasma medium, allowing us to provide ’tissue sublimation’ which literally vapourises tissue. While clinical trials are awaited, it appears to be offering a good alternative with good tolerability and outcomes.